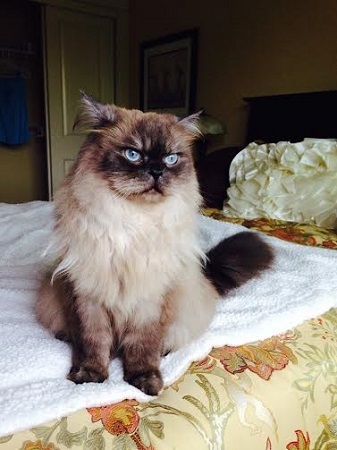 Hello, I’m Sammy and as you can see I am one beautiful Himalayan kitty, but I am so much more than a handsome, flat face and long, silky coat. I am a sweet, mellow, 5-year-old guy, and I will do okay with other animals if given a little time to adjust. I am little shy and, of course, crave one-on-one time. Look into my big, blue eyes, and you will want to pull me out of my shell and get to know me. I love to be admired, and if you brush me, I will reward you with loud purrs and kitty kisses. I also love movie nights’”you bring the popcorn and pick the movie, and I will snuggle up next to you on the couch. I am fixed, microchipped and vaccinated. My adoption fee is $100 and I am currently living in foster care.